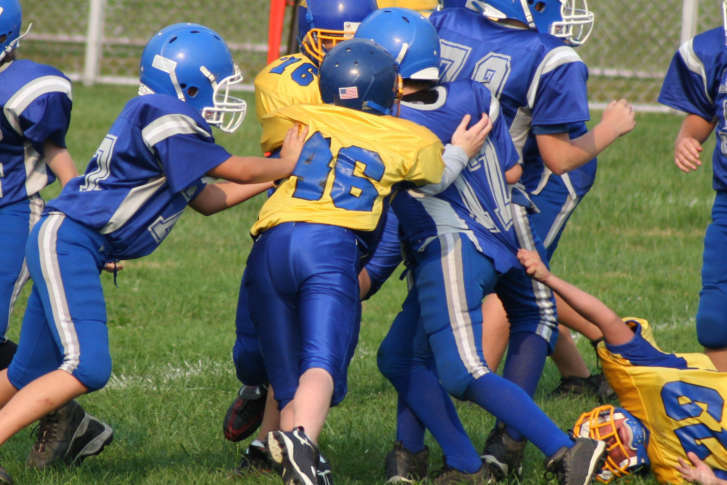 A Maryland lawmaker is drafting a bill that would ban tackling in football for children under the age of 14. WASHINGTON — As evidence of the lasting cognitive damage caused by football to developing brains continues to mount, one Maryland lawmaker has decided to take the issue to the statehouse. A new measure being drafted by state Del. Terri Hill, a Democrat, would prohibit the Maryland State Board of Education from approving tackle football programs for children under the age of 14 and require those 14 and up who want to play to take a course explaining the risks associated with concussions and brain injury. It would also include provisions against heading in soccer and checking in lacrosse for kids under the age of 14. The bill is expected to be finalized before Friday, the House deadline to be assured of a hearing. Both New York and Illinois have introduced similar measures in recent weeks. But Hill, whose district covers parts of Baltimore and Howard counties, sees her bill not as an attack on the sport, but rather an effort to inform the public of a mounting health crisis. Before running for Maryland’s General Assembly in 2014, Hill spent her professional life working in medicine, earning her M.D. from Columbia University and practicing as a plastic surgeon since the early ’90s. She serves on the Health and Government Operations Committee. Hill’s bill will follow on the heels of another measure she recently introduced, HB 552, which would mandate a licensed health care provider or an individual who has completed concussion risk and management training to be on the sideline for every practice and game for youth sports leagues that use any public facilities or those that occur on grounds that receive public money. Furthermore, it requires that this individual be empowered to make the final decision on return to play following a head injury. HB 552 will be heard in Annapolis on Thursday, Feb. 15. While Hill initially thought pushing both bills in the same legislative session might be too ambitious, she realized she couldn’t pursue one without the other. One person helping Hill craft the bills and garner support for them is a familiar name among area football fans. Madieu Williams played at Duval High School in Lanham, Maryland, and the University of Maryland before embarking on a nine-year NFL career as a safety that finished back in Washington in 2012. Now a law student at the University of Baltimore, Williams provides a voice of experience with perhaps an unexpected view of the game. Williams himself did not play tackle football until his ninth-grade year at Duval, when he was 14 years old, but still enjoyed a long NFL career. With a son of his own, he sees no reason for his son to either, especially given the emerging science that has come out the past few years. The news of the Maryland bill comes on the heels of a recent Aspen Institute program held in D.C. titled “Future of Football,” which devoted its panel discussions to the question of whether flag football could become the standard for pre-high school play and what effect that might have on the sport at all levels moving forward. The two former players on the panels were Domonique Foxworth, Williams’ former teammate at Maryland, and Chris Borland, who made headlines for retiring from the game at age 24. Foxworth echoed Williams’ view on how he’s approaching the game for his own son. Williams actually consulted Borland in helping to craft the bill, which the latter believes is the only way to enact meaningful change within the sport. Practically, it’s unclear yet exactly what would happen to existing youth tackle football programs. But flag football programs exist in various forms around the country, and flag is even being promoted as an option by USA Football. Ultimately, Hill said the intent of both measures is to protect the health of the next generation. She said she’s been encouraged by the discussions she’s had, as well as by the reception among her peers. “Both of these bills are designed for us to show greater appreciation for how fragile the brains of young people are and respecting that in terms of what kinds of activities we allow them to participate in,” she said.